Looking for a high quality kitchen knife that is a cut above the rest? LeDish brings you the answer with our professional 5 piece knife set packaged in protective gift box. Be prepared to tackle all your cooking, chopping, cutting, dicing and peeling with our state of the art sharp color knife set. 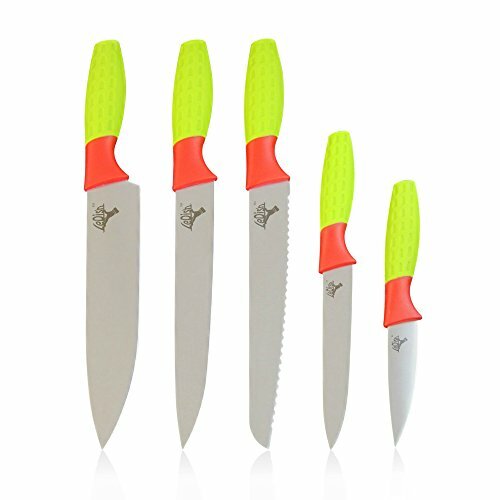 Contents 8" chef knife 8" slicer knife 8" bread knife 5" utility knife 3.5" paring knife product key features ✔comfort grip handle won't slip even when wet. ✔Stainless steel knife with rust free blade to protect your health. ✔Easy to clean / dishwasher safe. ✔Sharp blade to prevent dull cutting and kitchen mishaps. ✔Cheerfully colored to brighten the day. Ideal gift set for hostess holiday birthday engagement wedding chef in the making LeDish - creating delish. Happy preparing hurry and place your order now to bring the joy and ease of cooking home. Click the 'add to cart' button now. If you have any questions about this product by LeDish, contact us by completing and submitting the form below. If you are looking for a specif part number, please include it with your message.